Remediation performance evaluations at multiple sites can provide useful information about the performance remediation technologies can achieve and their costs. While the results from a multiple site study only provide a general indication of what might happen at a particular site, the results can help guide remediation technology selection and set realistic expectations about the end points remediation can and cannot achieve. Overall, an average chlorinated solvent in-situ remediation project reduces the maximum groundwater concentrations in a source zone by about 0.2 to 1.4 Orders of Magnitude (OoM), which is equivalent to 41% to 96% reduction in concentration, due to remediation. While large amounts of monitoring data are collected as part of remediation projects, there is no one centralized repository of remediation performance and cost data. Data mining projects attempt to learn from the experiences of multiple remediation projects by: 1) compiling key data, such as the before- and after-remediation groundwater concentration data; 2) statistically analyzing these data; 3) drawing conclusions about remediation cost and performance. To date, most of these data mining projects have focused on chlorinated solvent sites. What performance has been achieved at in-situ remediation projects? What concentration metrics can be used? Does performance vary significantly between technologies? Does performance change when using total chlorinated volatile organic compounds (CVOCs) vs. Parent compounds? Do other factors such as chemicals, geology, project size, and depth correlate to remediation performance? Does treatment duration, monitoring duration, or the number of monitoring points correlate with performance? How frequently did in-situ remediation projects achieve drinking water standards? What is the cost of in-situ treatment? Are the benefits of in-situ remediation sustained for years, or do concentrations eventually rebound? How does active remediation compare to monitored natural attenuation (MNA)? Has remediation performance improved over time? What “percent restored” does a typical active in-situ remediation project achieve for groundwater? Data mining works on the simple principle that the more data included in the analysis, especially data from multiple sources, the more powerful are the conclusions that can be made from it. Data mining allows a user to test a hypothesis, or alternatively, to develop new hypotheses based on patterns that may not have been apparent from individual datasets. The data mining projects described in this article focused on in-situ groundwater remediation technologies, with a secondary emphasis on untreated (monitored natural attenuation) sites as a basis for comparison. The studies focused on the following technologies: anaerobic bioremediation; in situ chemical oxidation; thermal treatment; and in situ chemical reduction. The ultimate goal of the data mining effort was to produce a single performance metric for each site based on actual concentration versus time data from one or more wells located within the treatment zone. To achieve this goal, most multiple site studies separated groundwater concentration data from each well at a site into before-treatment and after-treatment time periods. Typically, groundwater monitoring data are used to evaluate performance because most sites do not or cannot accurately measure the before- and after-remediation contaminant mass. Mass discharge is becoming a more common performance metric, but it is still relatively rare. Therefore most multiple-site remediation performance studies focus on the reduction of contaminant concentrations in groundwater monitoring wells. Many studies use either the geometric mean (geomean) of measured concentrations or else the maximum value from each time period to provide a single “before” concentration and a single “after” concentration for each well. The before and after data points from multiple wells are often further reduced by calculating the median value, resulting in a single before treatment concentration and a single after treatment concentration for each site. Calculating OoM reduction as the negative logarithm of the after-to-before concentration ratio produces a simple metric that typically varies from 0 to 5, with each integer representing an order of magnitude. The method is analogous to calculation of pH values in chemistry. OoMs directly correlate to “the number of 9s in percent reduction” (e.g., 1 OoM = 90% reduction, 2 OoMs = 99% reduction, and so on). A key concept is that a reduction up to five OoMs may be required at some chlorinated solvent sites to achieve drinking water standards. Remediation cost is often normalized by dividing the total cost by the treatment volume (as in-place cubic yards) to allow for more direct comparison between technologies. In 2004, Geosyntec and the Navy used a web-based survey to provide information on site characteristics, source zone characteristics, technologies used, remediation cost, treatment duration, and remediation outcomes. A 2007 report provided additional data analysis from the 2004 project. Funded by SERDP, McGuire et al. (2006) summarized performance and cost information for 56 chlorinated solvent remediation studies. The paper indicated that median concentrations of chlorinated solvents in groundwater are reduced by about 1 OoM as a result of in-situ remediation and that chemical oxidation sites are more prone to rebound. Krembs et al. (2010) reported performance data from 55 chemical oxidation projects. Results indicated that chemical oxidation at most sites achieves about 0.2 to 0.8 OoM reduction in the maximum concentrations of chlorinated solvents in groundwater. Kingston et al. (2012) provided performance data for 5 thermal remediation projects. Results indicated that these projects achieved <1.0 to 2 OoM reduction in dissolved groundwater concentrations. The Interstate Technology and Regulatory Council (ITRC) summarized the McGuire cost and performance data in their “Integrated DNAPL Site Strategy” technology/regulatory guidance in 2011. Stroo et al. (2012) published “Chlorinated Ethene Source Remediation: Lessons Learned” which recognized the limitations to in-situ treatment of chlorinated solvent sites and discussed how improving characterization and enhancing treatment technologies were key strategies for managing chlorinated solvent sites. McGuire et al. (2016a) expanded their 2006 study to 235 sites. The results of this “235-Site Study” are summarized below. Figure 1. “Triangle Plots” showing the before-treatment concentration on the X-axis and the after-treatment concentration on the Y-axis. Because each axis has a logarithmic scale, the dashed diagonal lines represent orders of magnitude (OoMs) of reduction achieved as indicated by the diagonal labels on the secondary Y-axis. The different color symbols represent different treatment technologies. The left panel is the geomean of the before- and after-treatment concentrations in groundwater while the right panel shows the before- and after-treatment maximum concentrations in groundwater. 235 remediation projects and 45 natural attenuation projects. 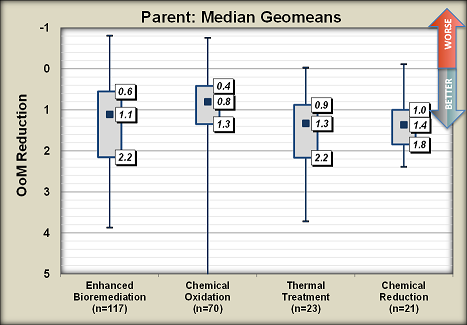 Performance results were evaluated based on both geomean concentrations and maximum concentrations of parent compounds in treatment zone groundwater before and after treatment (Fig. 1). Geomeans were used instead of arithmetic averages because groundwater characteristics are generally better represented by a log-normal statistical distribution rather than the “bell curve” type distribution that is assumed when using arithmetic averages. Each symbol on the graphic represents a remediation project. The overall performance, in terms of “OoM Reduction” achieved by each project, is determined using the diagonal axis. Design engineers for a remediation project are more likely to be interested in geomean concentrations, as this metric better represents the overall performance throughout the treatment zone based on the geometric average data from all the wells. Environmental regulators are more likely to be interested in maximum concentrations because one monitoring well with the highest concentration will determine whether regulatory cleanup standards were achieved at the site. Performance results varied little between technologies as shown in Figure 2. Chemical oxidation appeared to have the worst average performance (lowest OoM reduction) and thermal the best (highest OoM reduction), but there was no statistical difference in their performance at the 0.05 confidence level. Thermal remediation projects did appear to be applied at higher concentration sites (median before treatment concentration of 10 mg/L for the parent compound), while bioremediation was applied at lower concentration sites (median before treatment concentration of 0.74 mg/L). Figure 2. Order of Magnitude (OoM) reduction in the source zone geometric mean concentration for four different remediation technologies. Scale is reverse so better performance is towards the bottom of the graph. The grey box represents the middle 50% of the data (25th to 75th percentile) with maximums shown as “whiskers” extending from the top and bottom of the grey boxes. The median is shown as the small black square. For site restoration, an important metric is for all the monitoring wells to achieve concentrations below Maximum Contaminant Levels (MCLs), or the drinking water standard. The prevalence in achieving MCLs in all monitoring wells at sites was evaluated using maximum concentrations. The results indicate that the attainment of MCLs across an entire site is rarely achieved (i.e., only 7% of sites achieved MCLs in all treatment zone monitoring wells) as shown in Table 1. The post-treatment remediation performance data was also examined for the incidence of rebound where concentrations fall during active treatment, but then increase (rebound) after treatment. For this study, rebound was defined as an increase in concentration (expressed as a change in OoMs) from the first monitoring period after remediation activities are terminated to the last monitoring period of the dataset. The post-treatment monitoring period ranged from as little as one year to 12 years at a few sites. Consistent with the rebound analysis previously reported by McGuire et al. (2006), the data indicated that rebound was most prevalent at sites where chemical oxidation was used, with about 30% of the monitoring wells exhibiting concentration rebound. 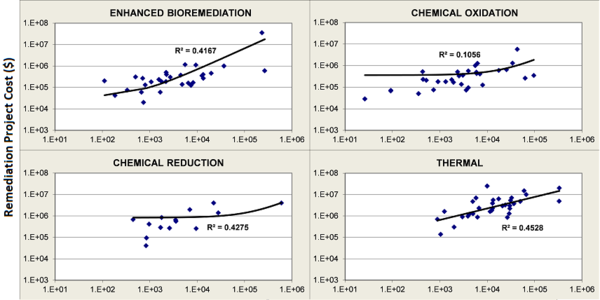 Bioremediation had the next highest rebound frequency, with about 25% of wells showing rebound; however, the severity of rebound was not as high as chemical oxidation. Thermal and chemical reduction project appeared to have the least rebound. A companion study of enhanced bioremediation sites with at least three years of post-treatment monitoring data found that sustained treatment processes, in which treatment effects extend long past the end of active treatment, were able to mitigate rebound of the parent compound at a majority of the sites. Figure 3. 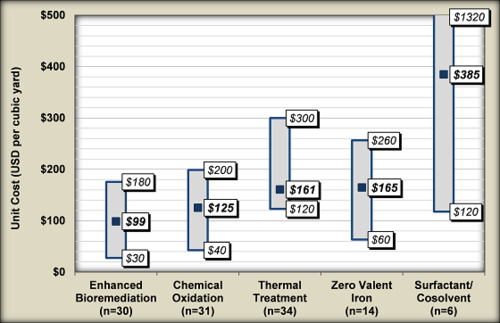 Unit treatment costs showing the middle 50% of all sites (25th percentile to 75th percentile) for five different in-situ remediation technologies for chlorinated solvent source zones. The median cost is shown by the small black square. McGuire et al. (2016a) found that the unit cost for a typical in-situ remediation project ranges between $100 and $300 per cubic yard, with some projects below $10 and some over $1,000 per cubic yard (Fig. 3). The median thermal project (n=34) was about 50% more expensive than enhanced bioremediation and chemical oxidation projects. In terms of overall project costs, thermal projects had the highest total costs compared to bioremediation, chemical oxidation, and chemical reduction, with most of the thermal projects exceeding $1 million (Fig. 4). Only a few projects exceeded $1 million in total costs for the other three technologies. Figure 4. Total Treatment Cost ($) as a function of treatment volume (cubic yards). The deliverables of the 235-site ESTCP project include a Final Report and a Cost and Performance Report that contain numerous charts and graphics intended to inform the remedial decision-making process, as well as an electronic Decision Support System that allows the user to select various site parameters and remedial technologies to see actual remediation performance data for sites with the selected characteristics. The dataset is not intended to: a) replace thorough technology screening, design, and/or pilot testing; or b) predict remediation outcomes at a specific site. Instead, the dataset is intended to provide a range of expectations based on levels of performance that were achieved at many other sites with similar characteristics. The dataset can aid the remedial decision-making process, where site stakeholders use the data for technology screening and conceptual design, but will be less useful at the detailed design stage. For sites that are already undergoing active remediation, we envision that the dataset could be particularly useful for Five-Year Reviews at federal cleanup sites and for performing transition assessments at complex sites. Several different multiple-site studies have examined the cost and performance in-situ remediation at chlorinated solvent sites. Although remediation does provide important benefits, complete restoration is rare. The 235-Site Study found that only 7% of these sites achieved drinking water standards for the parent compound at all wells in the treatment zone. Two key metrics are commonly used to evaluate concentration changes from before- to after-remediation: geometric means and maximum concentrations. Geomeans are more useful for evaluating treatment performance throughout the treatment zone. However, regulators are more likely to focus on the maximum groundwater concentrations. The cost of most remediation projects ranged between $100 and $300 per cubic yard. The median thermal project (n=34) was about 50% more expensive than enhanced bioremediation and chemical oxidation projects. This page was last edited on 23 August 2018, at 13:54.